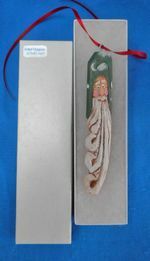 This hand carved Santa Claus Christmas ornament is a fun stocking stuffer for under the tree this holiday. A little accent for a Christmas tree, holiday wreath or gift package. Woodcarvings and Limited Editions are subject to availability.